The building is split into two separate living accommodations and has storage space attached to the building. This storage could be turned into private parking for the house. The ground floor has three divisions and the upper floor four. 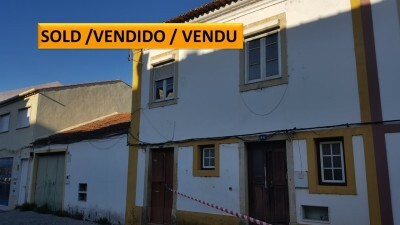 The building needs some work but could be made into a nice rental business since the property is situated in the middle of town and beside the river. There is a bathroom so basic plumbing is already fitted although could probably be doing with updating. The property is situated in the popular and bustling town of Tomar, which is home to the UNESCO listed Convento do Cristo. Tomar has a range of supermarkets, shops, cafes, restaurants, bus and train station, cinema, bowling alley and library as well as pharmacies, banks, schools, hospital and weekly market.